Well, it looks like the new calf's name is officially Thor. I wasn't crazy about it at first but it's kinda grown on me. Thor is beautiful! Big doe eyes and dun or brown fur, not the reddish brindle coat that his older sister Pearly has. 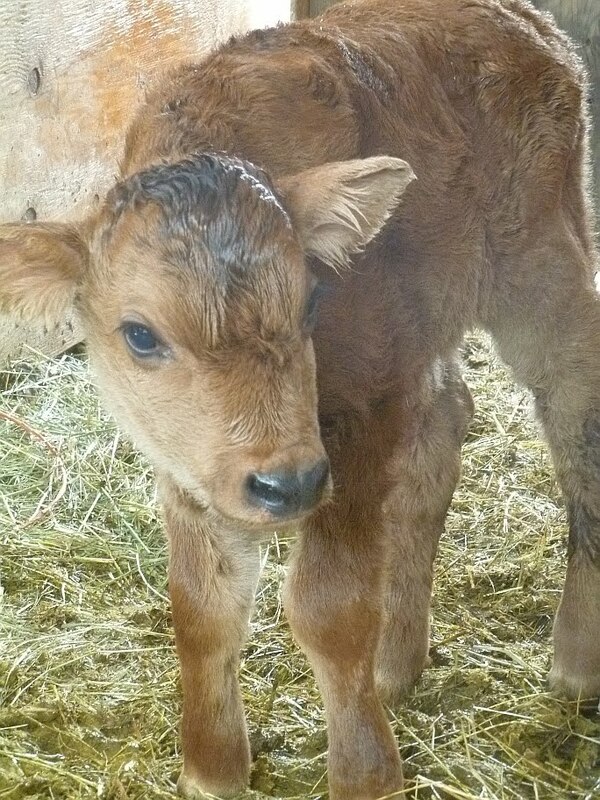 Calves are so durn cute at this age. It's hard to resist taking too many pictures. It looks like she tore it on a nail or something. Must hurt like the dickens! I searched the barn and didn't see any obviously protruding nails, so who can say how she got it. At any rate I'm keeping a tube of triple-antibiotic ointment in the barn and I'm slathering it two or three times a day to keep the wound from getting infected. Notice how Matilda is nuzzling Thor's bottom while he's nursing? 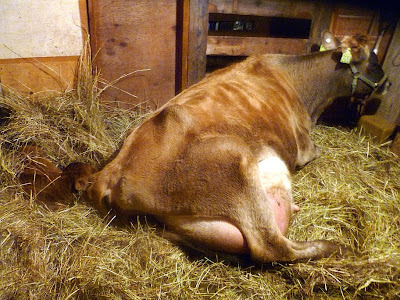 It seems revolting, but it is very typical behavior of a cow to vigorously lick her calf's bottom while it's nursing. It encourages a calf to deficate. Hey, whatever works I guess. When we checked on Thor late yesterday evening, we actually found him half-covered with hay. This was the best thing that could be - hay is a superb insulator for farm animals. 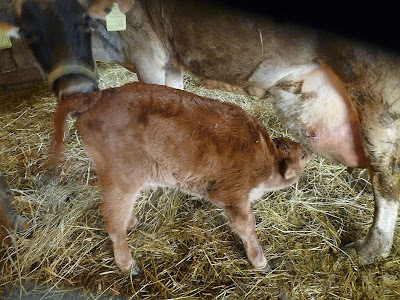 We actually totally covered him with hay before leaving the barn for the night - it was cold outside, and this meant little Thor (with a belly full of warm milk and a blanket of hay over him) was as snug as a calf could be. Baby farm animals are the cutest! Thor looks like a hearty little guy. Lets hope he is as strong as his namesake when he grows up, so he can pull a plow or cart. When we move to Vermont, we are hoping to get Milking Devons for plow, milking and meat. Patrice, Thor is absolutely adorable! I look at Matilda's huge bag of milk in the last pic and think how miserable she must be. I'd want to milk her just to take some pressure off, but I know that would mean Thor wouldn't get all the good stuff. Thanks for sharing! Poor Matilda with that nasty owie. Interesting how it works the same with cows and humans, where the milk supply adjusts beautifully to the demand. Lucky little guy, surrounded by people and critters who love him. MMmmmmmmmmmmmmmm!!!!!! "Oxen are usually yoked in pairs. Light work such as carting household items on good roads might require just one pair, while for heavier work, further pairs would be added as necessary. A team used for a heavy load over difficult ground might exceed nine or ten pairs." He is cute. Great pics. Whatta cutie Thor is....such a beautiful color - will that change as he grows up? Thor is just adorable! But boy does his Mama look uncomfortable :( Poor thing! Thank you for posting the cow birthing and the adorable calf. We have had goats and seen lots of their births, but never a cow's birth. Being a homeschool, small farm, family we love this type of thing. It's a virtual field trip! PS. Just recently found this blog while researching the reusable canning lids (which I did purchase)and I love this blog! Sharp hooves can cut an udder just as quickly as a nail. Just a thought in case you do not find the offending object. When I milk my Miss Tilly in the cold months, my outer layer is a pair of Cabela's sherpa lined, fleece hunting pants. They are toasty. Miss Tilly also thinks she has to lick my pants sometimes when I am brushing her in preparation for milking. I guess she thinks the texture is calf-like.